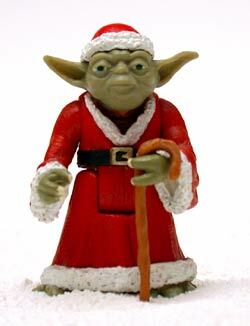 Santa Yoda, as featured in a Lucasfilm Christmas card by Ralph McQuarrie, was a fairly simple custom. I used an acrylic modeling paste to do the white trim on the hat, cuffs, and bottom of the robe. To make the hat I sculpted it on the head out of sculpey, took it off the head, and cured it. Now it is removeable but fits snuggly on Yoda's head. I added a belt buckle and painted it accordingly.